This 22-story, light-gray brick building has a very striking terraced top that culminates in a large, glass-enclosed elevator "house." It was designed in 1941 by Mayer & Whittlesley, an architectural firm that also the same year designed 240 Central Park South (see The City Review article), which features a similar rooftop shape although not glass-enclosed, the same year and was a co-architect with Skidmore, Owings & Merrill on Manhattan House at 200 East 66th Street in 1950. Mayer & Whittesley also were co-architects with M. Milton Glass of another through-block apartment building at 220 Central Park South (see The City Review article) in 1954. This building occupies the former site of the Dalhousie, an early apartment house that dated to 1884. The building is actually in two parts and on the other side of its garden is an 11-story structure at 41 West 58th Street of the same style that has a similar marquee and façade address marker. This building has a stainless steel, upturned marquee supported by poles attached to frog sculptures on the façade. It has a large, windowed lobby with a glass wall waterfall. 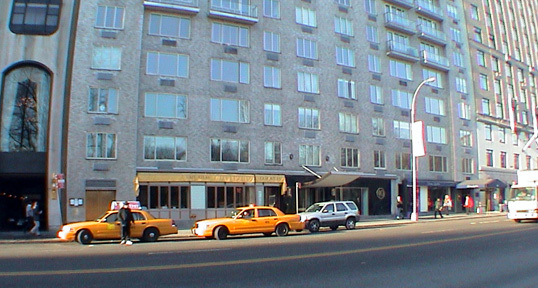 The building has two large restaurants along its Central Park South façade, a garage, bright wall lanterns and many balconies with glass walls. Its east and west ends project slightly from the facade to modulate its mass somewhat. The building, which is just to the west of the Helmsley Park Lane Hotel and not too far from the Plaza Hotel, also has a concierge, and a one-story polished black granite base. The building has 139 rental apartments and no sidewalk landscaping and no health club. It has a concierge and a garage and many balconies. 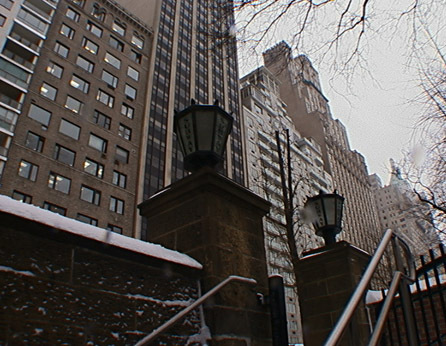 The building's site runs through to 58th Street where it has an 11-story building separated by a garden from its Central Park South Building. The 58th Street building has a similar entrance marquee. "Forty Central Park South consisted of small apartments, although many had fireplaces in their living rooms, and extensive hotelservices were provided. The upper floors, where zoning prescribed setbacks, consisted of penthouse-type apartments that piled up to the building's crowning feature, a glass-eclosed elevator penthouse. 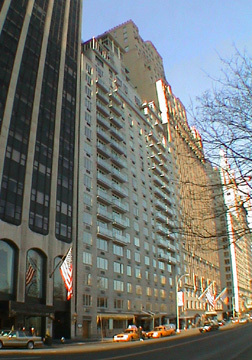 Together with the extensively glazed lobby and the simple vocabulary of gray brick and white-painted steel sash, the penthouse gave the design a sense of the restained, nonpolemical Modernism that distinguished not only 240 Central Park South but also Wallace K. Harrison and J. André Fouilhoux's style-setting Rockefeller Apartments of 1936." The glass-enclosed elevator "penthouse" is obviously a place one would like to visit as it would appear to be one of the city's great "rooms."